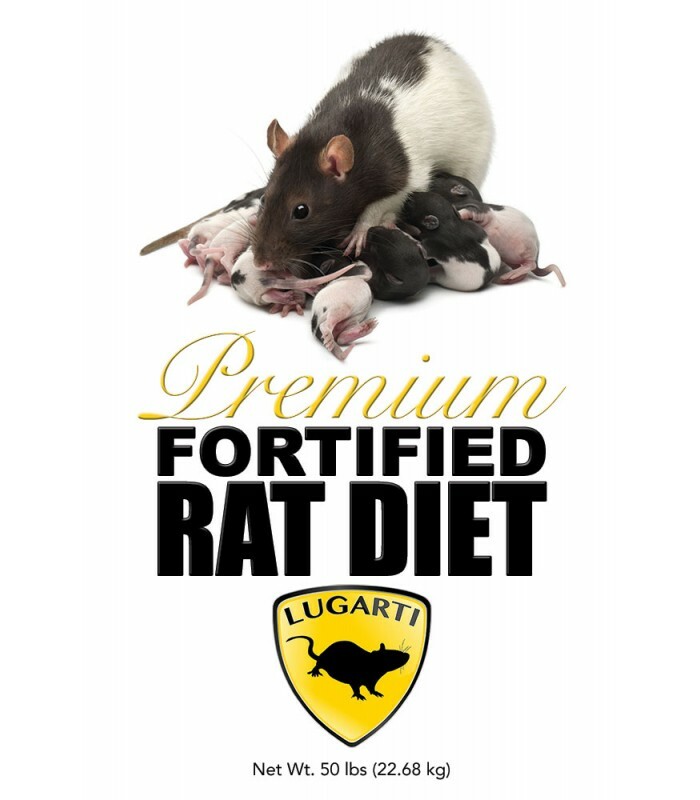 Lugarti’s Premium Fortified Rat Diet is a 1/2" lab block made with high quality ingredients and provides optimal protein, fat, and vitamins that meet the nutritional requirements of all life stages, including growing, pregnant and nursing rats. Nutrition is key to maintaining good health in your rat. 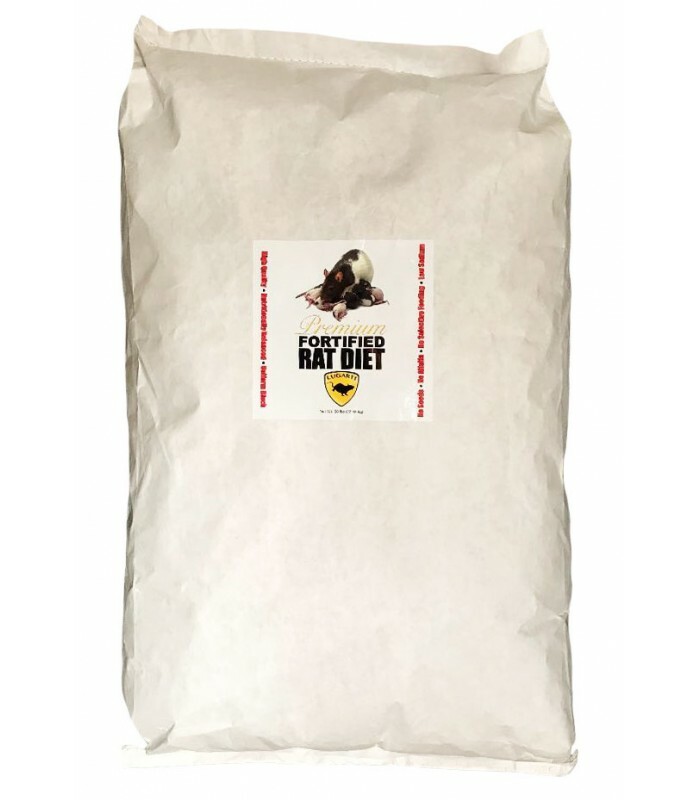 A good base diet containing essential protein, fatty acids, vitamins and minerals, along with a variety of vegetables, fruits, and nuts, will allow your rat to thrive and avoid potential health issues. 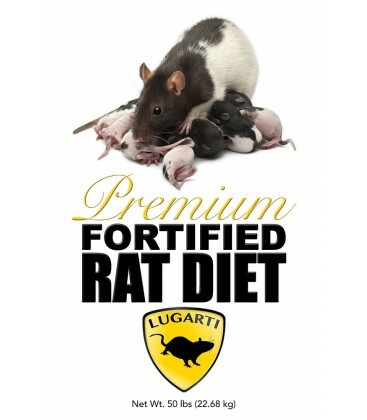 Offering Lugarti’s Premium Rat Forage Mix (Coming Soon!) in addition to this staple diet provides the benefits of a complete and balanced diet (80/20 ratio). 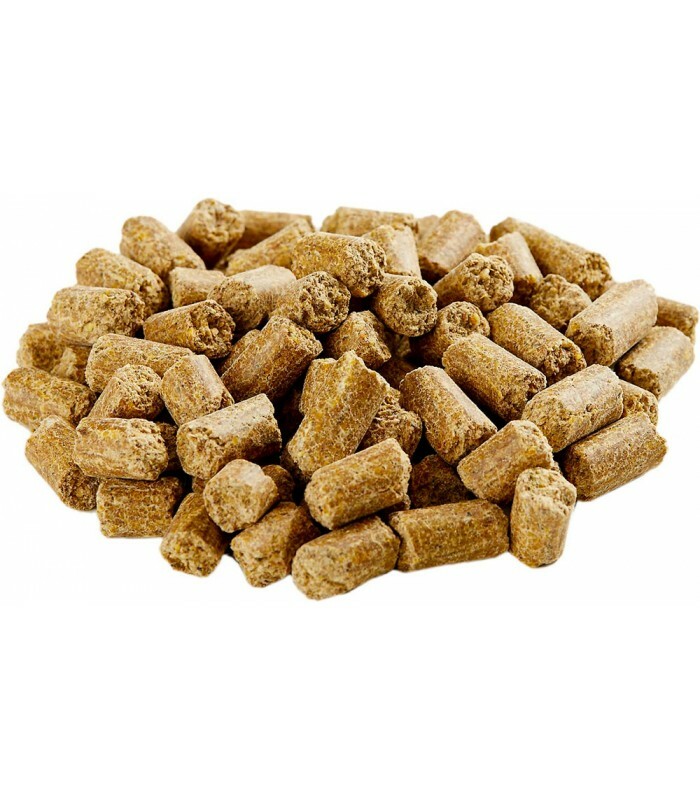 Dehulled Soybean Meal, Ground Maize Grains, Ground Wheat, Wheat Middlings, Chicken Fat, Soy Oil, Cane Molasses, Brewer’s Dried Yeast, Calcium Carbonate, Fish Meal, Whey Protein Concentrate, Potassium Calcium Magnesium Clinoptilolite (Natural Zeolite), Lignin Sulfonate, Choline Chloride, Zinc Sulfate, Manganese Sulfate, Ferrous Sulfate (Iron), Alpha Tocopherol (Vitamin E), Copper Sulfate, Niacin (Vitamin B3), Sodium Selenite, Retinyl Acetate (Vitamin A), Calcium Pantothenate (Vitamin B5), Cobalt Sulfate, Riboflavin (Vitamin B2), Biotin (Vitamin B7), Thiamine Mononitrate (Vitamin B1), Vitamin B12 Supplement, Vitamin D3 Supplement, Pyridoxine Hydrochloride (Vitamin B6), Folic Acid (Vitamin B9), Calcium Iodate, Monocalcium Phosphate, Dicalcium Phosphate, Salt, Propionic Acid, Yucca Schidigera Extract. IMPORTANT: It is critical to always have fresh food and clean water available at all times. Sometimes rats that appear to be “sick” are usually just dehydrated and or malnourished. Manufactured and stored in a clean, moisture-free and insect-free facility.